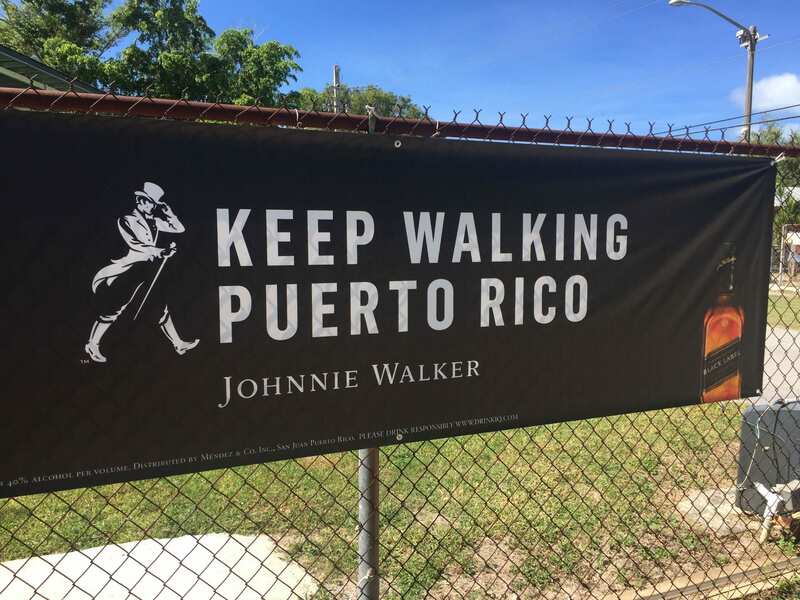 Johnnie Walker says it all: Keep Walking Puerto Rico, an encouraging message after Hurricane Maria in September, 2017. After an easy few flights, Jerry and I landed in San Juan at 10 PM, enveloped by muggy heat and eager to pick up our air-conditioned car. 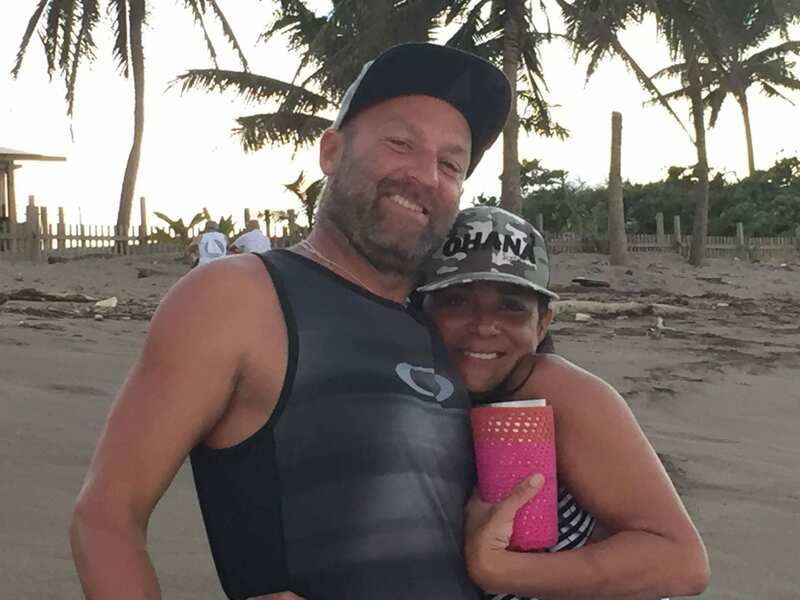 My son Ross and his girlfriend Shanna offered to meet us at the airport, but since they were a half hour away, we decided to just use my phone’s google maps to find them. Big mistake. There are numerous streets called Calle Coral, and we navigated to the wrong one, miles from Shanna’s apartment. My phone died as Ross tried to orient us, so there we sat, lost in a strange city at midnight. I finally discovered a usb port in the car and had Jerry pull over so I could jump out to get the charging cable from the trunk. Whew! Communication restored. We finally met Ross and Shanna, only to discover that my wallet was gone. Probably dropped on the side of the road when I hopped out for the charger. At 1:00 AM we all backtracked to cruise the side of the highway for my lost wallet. Nothing. 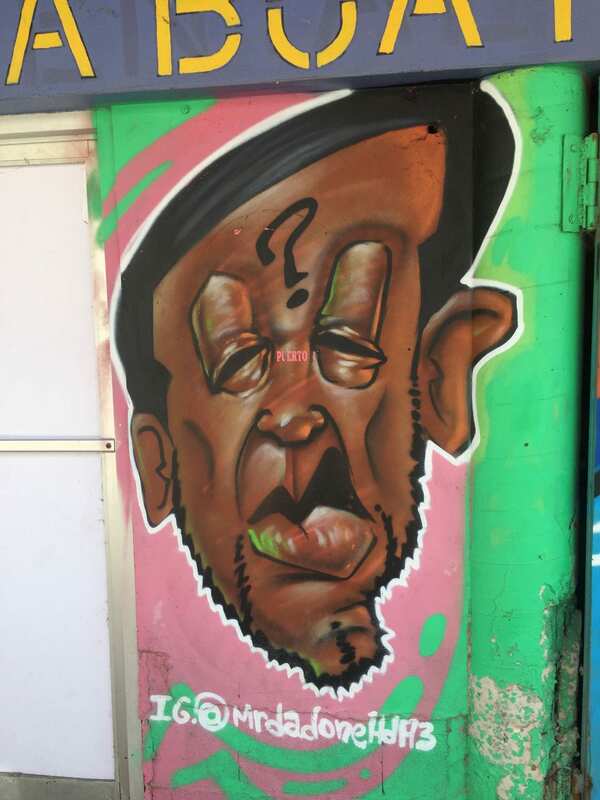 Shanna prompted, “You need to think like a Puerto Rican. We will find it. Let’s try a second pass.” Ross and I scoured the roadside with our cell phone flashlights, and at long last—there it lay! HOORAY!!! Disaster averted. Ross and Shanna, the reasons for our visit. 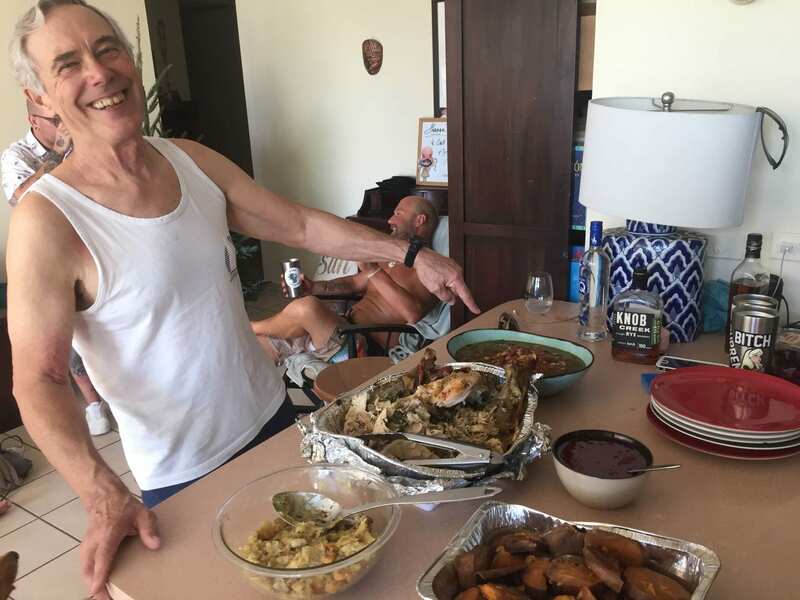 Thanksgiving felt odd in San Juan’s 85-degree, 95% humidity, but I was with my son and his Puerto Rican loved ones. The company was delightful and the food fabulous. Shanna stuffed a turkey with tantalizing yucca root mashed with garlic and herbs. YUM! The turkey fell apart in the pan, so we served ourselves from there. Sweet potatoes, a cold bean and vegetable salad, and the most delicious beans and rice I’ve ever tasted filled out our Thanksgiving repast. These people know how to do garlic. In fact, you can buy peeled garlic cloves in the store. Heaven! Jerry encourages us to enjoy the Thanksgiving repast. 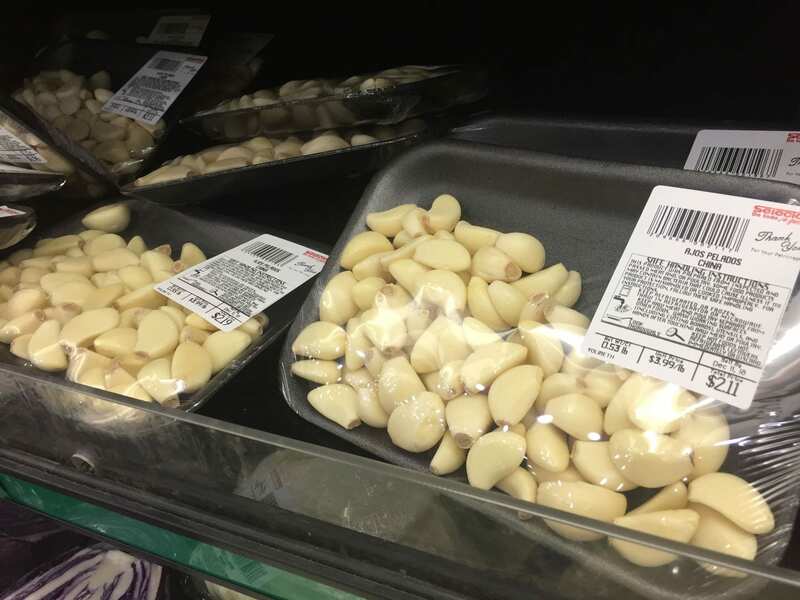 Peeled garlic cloves in the produce section of the store for a mere few dollars. And of course, there was football. I braved the heat with multiple trips to the pool, thanks to Shanna’s son Bayoan, a 10-year old charmer who worships water. Me, too. 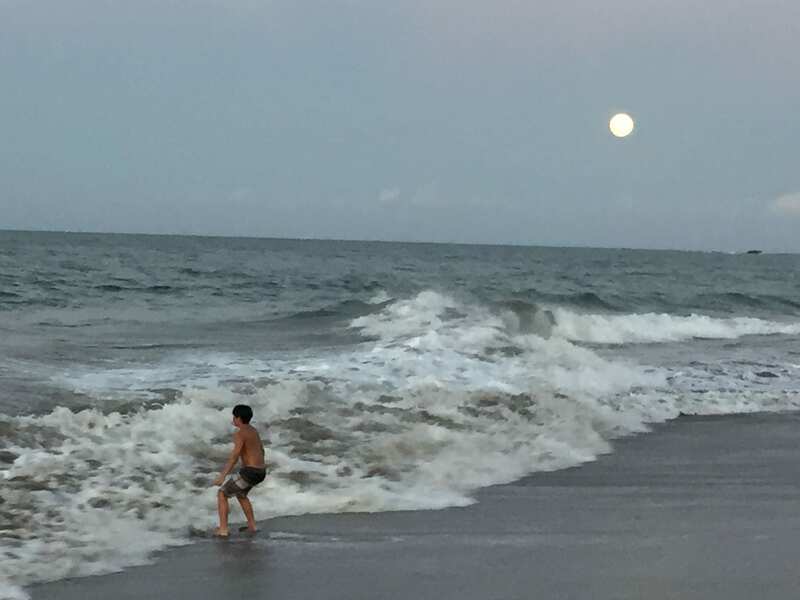 That evening we piled into Shanna’s new car for a beach sunset, where Bayoan romped in the waves, launching himself into each swell as it crashed on the beach. Bayoan romps in the San Juan waves at sunset. 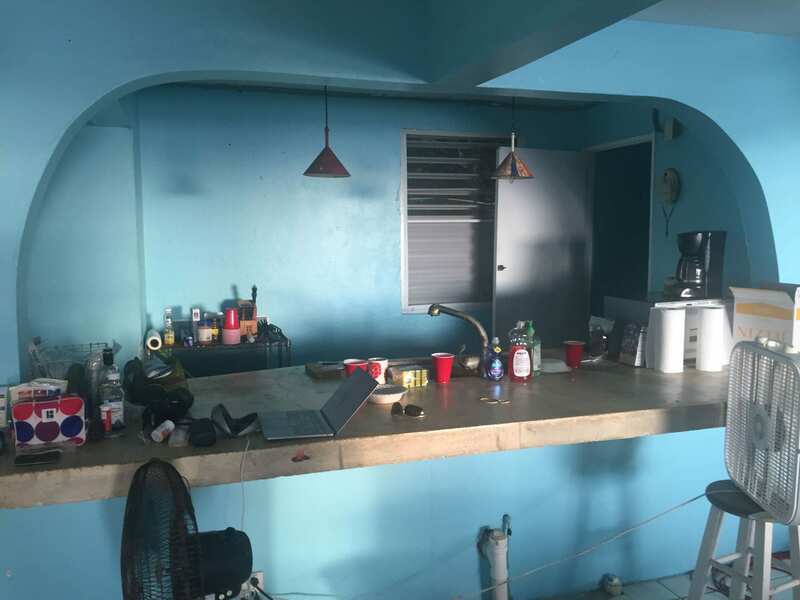 The next morning Ross led us to our home for the next few weeks, a beach apartment he’d rented a few years earlier in Aguadilla Pueblo. Our dreams of air conditioning and wi-fi were dashed. We did, though, have huge open windows overlooking the Caribbean. The waves served as our lullaby, both for daytime naps and nighttime snoozes. Our front porch just above the beach (built by Ross when he lived there). Ross mopped the floors and headed off to get us more fans, dishes, linens and a coffee pot while we came to terms with our humble abode. It had electricity, a nice couch and chairs, running water (cold only), a functioning microwave, and a few electrical outlets. We were welcomed by a resident cat, Mira (Spanish for “Look!”), because she meows incessantly. “Look at me! Look at me!” She marched in and made herself right at home, and she got lots of love from Jerry. Even though I’m allergic to cats, I found her amusing. 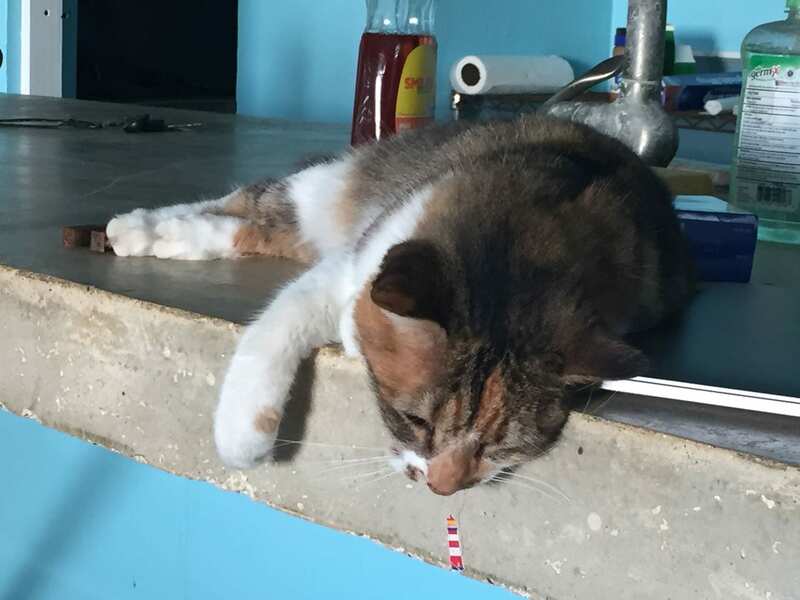 Mira relaxes on our counter. 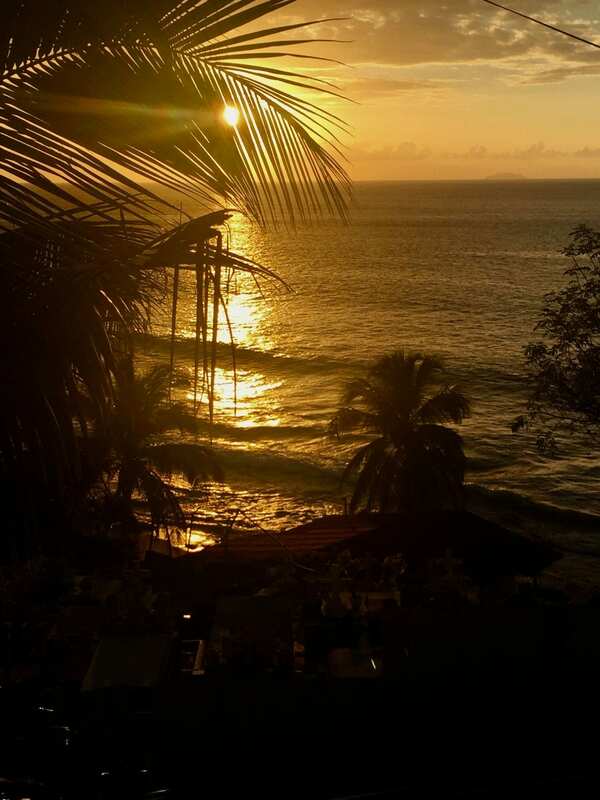 Sunset in Aguadilla–from the street above our apartment. We grew accustomed to our humble dwelling (a cold shower is easier if you wet your head first), and enjoyed exploring the area. One evening we happened on a community celebration with live bands and free food at a local restaurant. Though we’d already eaten, we shared a plate of tantalizingly spiced pork with beans and rice as we sipped on yet another beer and enjoyed the scene. Everyone in PR talks about Hurricane Maria. It’s deeply etched into everyone’s psyche and there’s evidence everywhere of devastated buildings. 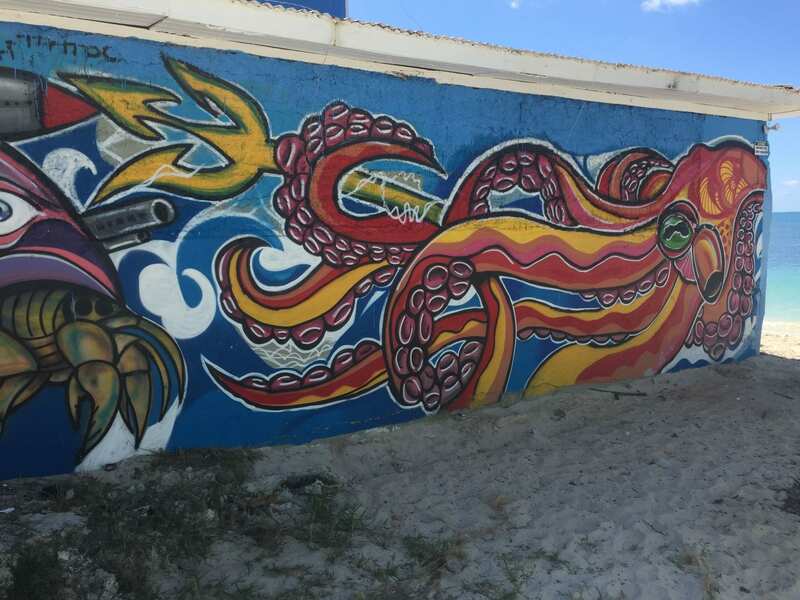 One woman we met at Jobos (pronounced Hobo), Ross’s favorite surfing beach, said that she hadn’t liked the U.S. until after the hurricane. A massage therapist, Christina said she was literally starving for weeks until U.S. organizations brought in food and water. She didn’t have much to say for Trump (everyone in PR seemed to despise him), but she was thankful for the generosity of Americans who donated to help PR. Sadly, too many corrupt officials stockpiled donations of food, water, and building supplies in warehouses to sell later at a profit. 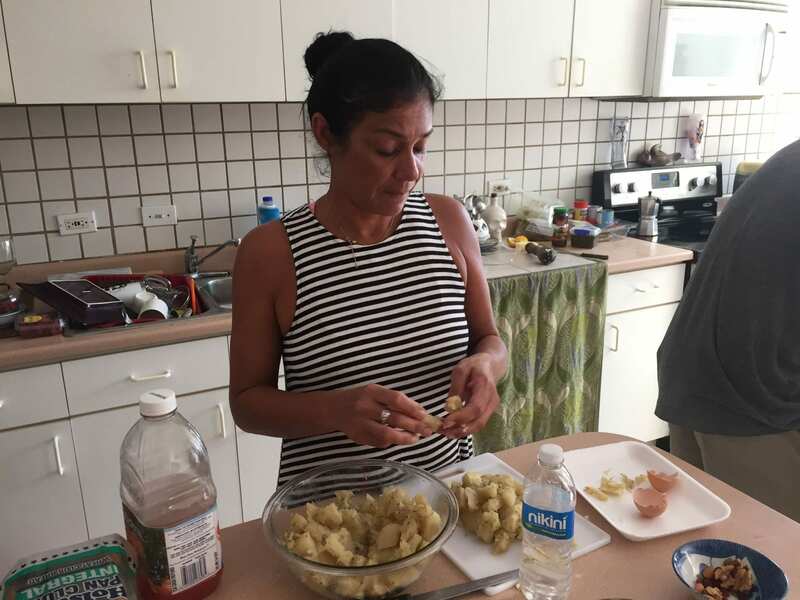 At a time when every Puerto Rican was scrambling to survive and to help each other, that behavior was unconscionable. Shanna said that in order to get water, her friend was required to sign off on getting 16 bottles when she was only given seven. If she didn’t sign, she got nothing. We seldom talked with anyone who didn’t need to share their Maria experiences. Heartbreaking. Many private homes and businesses have been or are being repaired, while government buildings still sit in disrepair, some deserted. 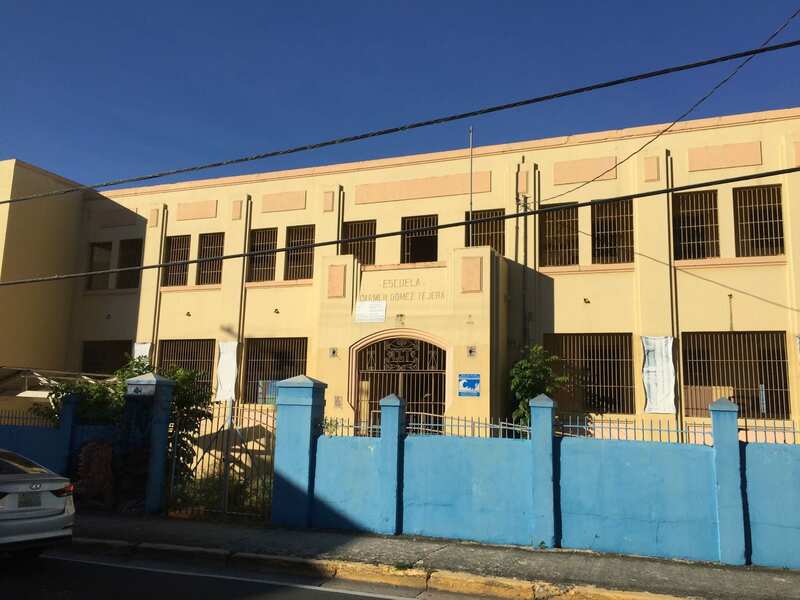 Just blocks from our apartment was an abandoned beachfront school and an abandoned government building. A park and sports arena at the south end of the town, once beautiful, look like a dumping ground of broken equipment, overgrown weeds, and piles of trash and leaves. 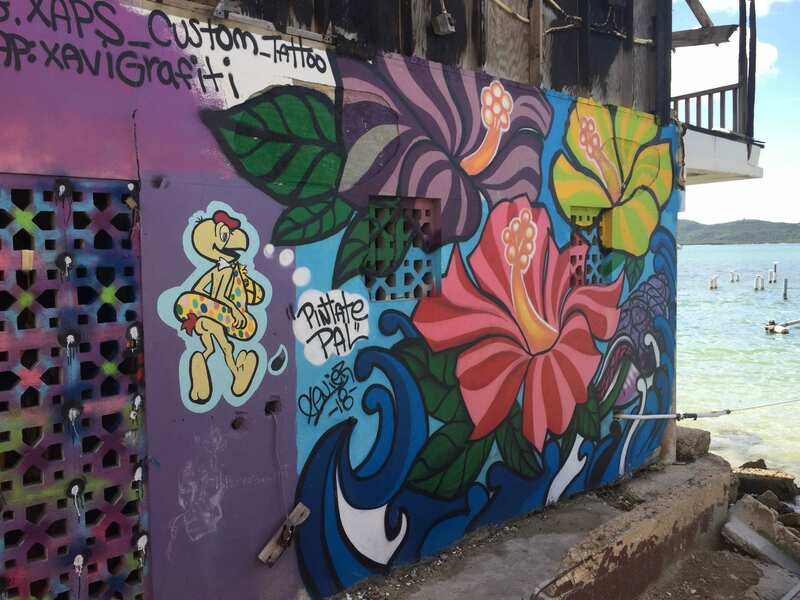 On the other hand, the entire country is brightened with street art—murals everywhere! We spent our week visiting beach after beach, snorkeling, swimming, and exploring—and learning about currents. Beware the rip tide. 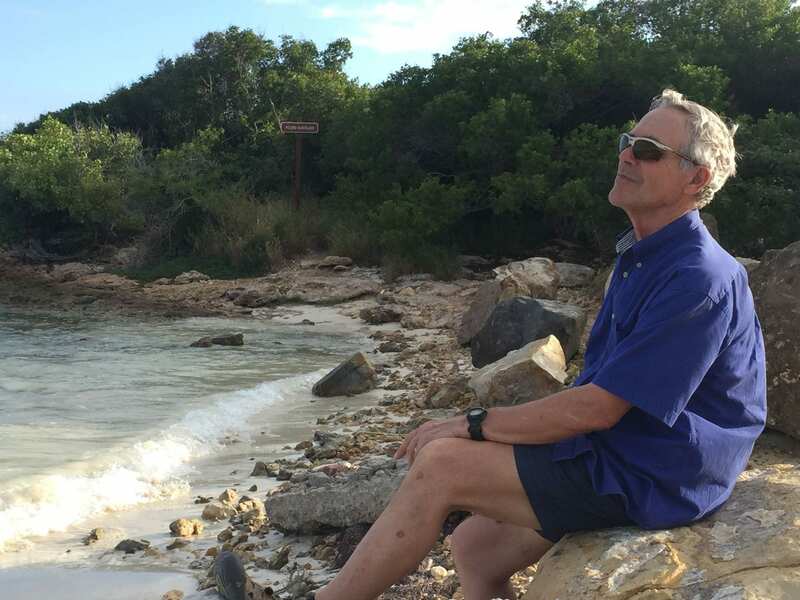 Jerry reveling at a beach in Cabo Rojo. 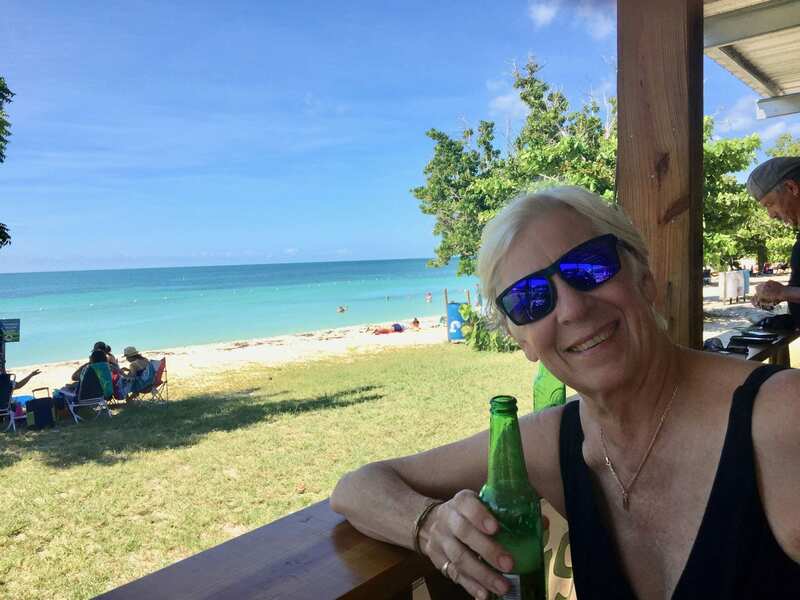 I indulged in a brew after a long swim at Buyé Beach. 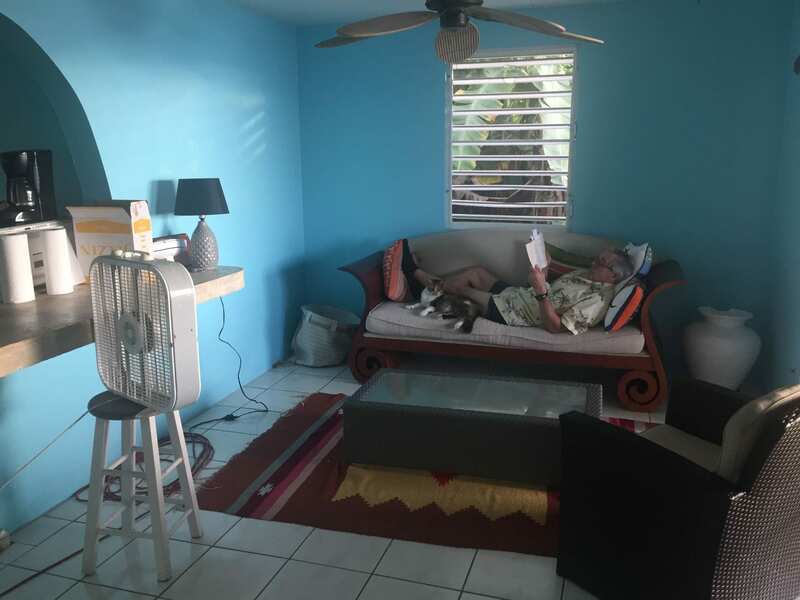 The second weekend we ferried over to Vieques (fare a mere $1 for seniors), a small island east of Puerto Rico, where we’d rented a lovely airbnb. Our host picked us up at the ferry pier in a dented-up old jeep. Michael was a delightful guide, an Irish/American/Puerto Rican who’s lived on Vieques for fifteen years. 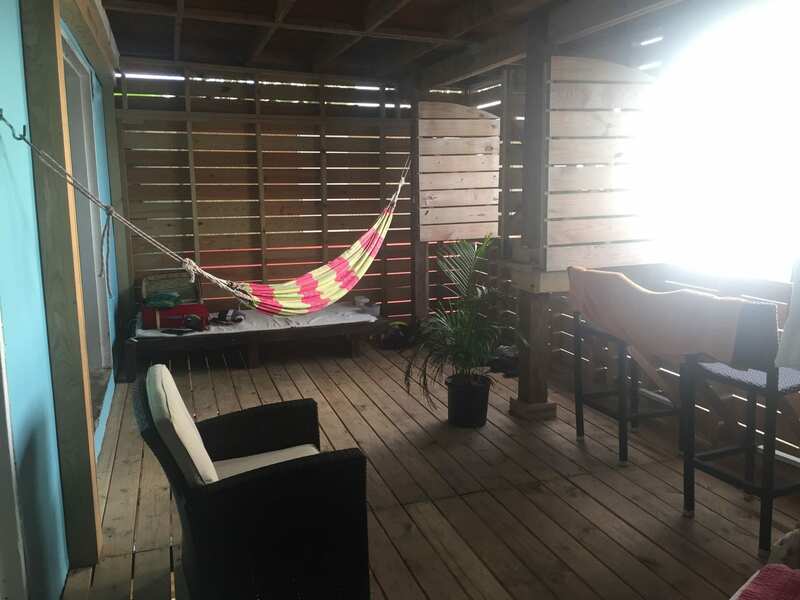 Our upstairs apartment, Casa Mama, was gorgeous—tastefully decorated and stocked with fresh baked bread, a pitcher of cold mango and papaya juice, eggs, fresh milk, coffee, and jam. Definitely a step up. Ross and Shanna joined us Saturday morning, and after a hearty breakfast we explored the island, discovering a 375-year-old ceiba tree. 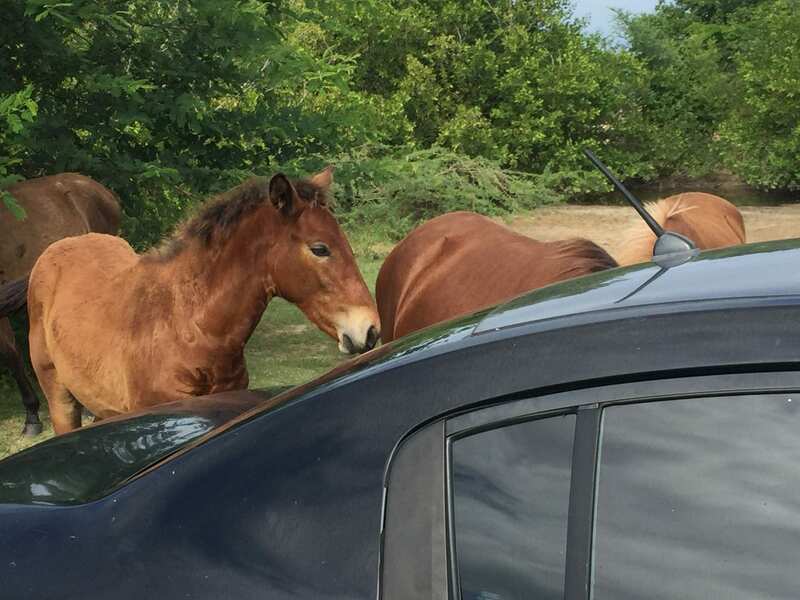 We also visited a sacred Taino aboriginal site and marveled at the scores of horses that roam the island. (2000, according to the internet.) Michael had warned us to beware of horses on the roads at night. 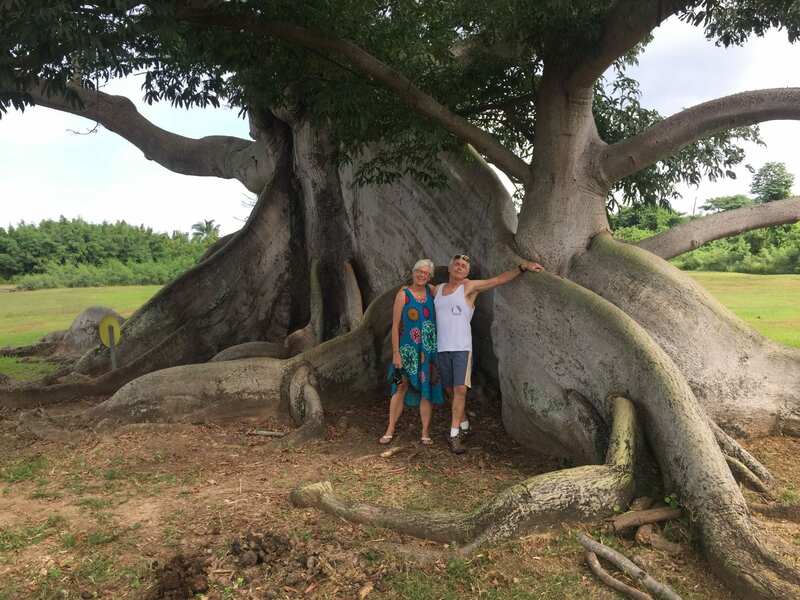 Ann Marie and Jerry pose under the 375+ Ceiba Tree. 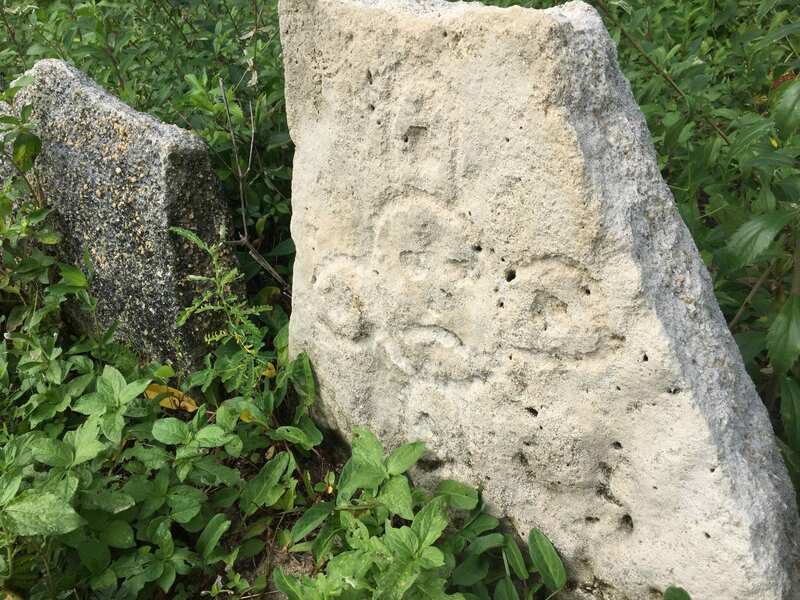 Shanna investigates a carved stone at the Taino sacred site. The Taino aboriginals were virtually wiped out by explorers. A Taino carving of one of their gods. 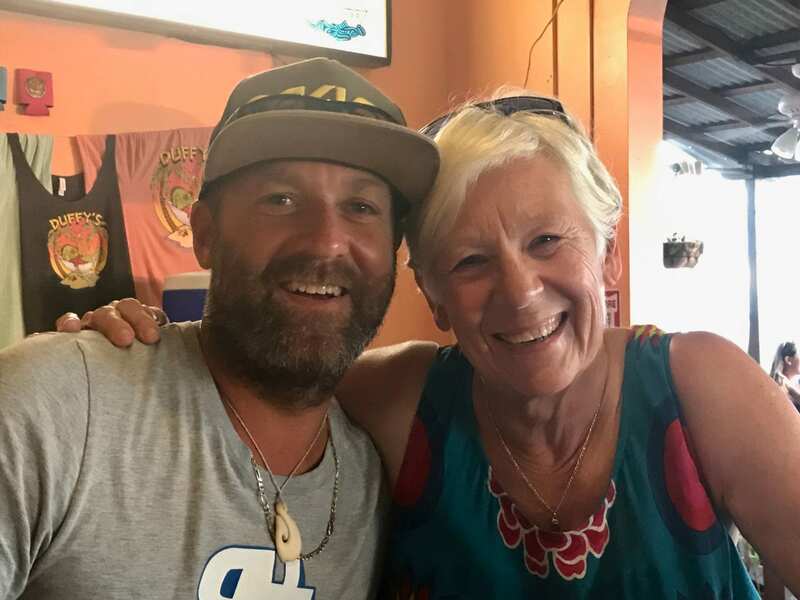 Ross and his old mom—such joy to have a few weeks in his world.